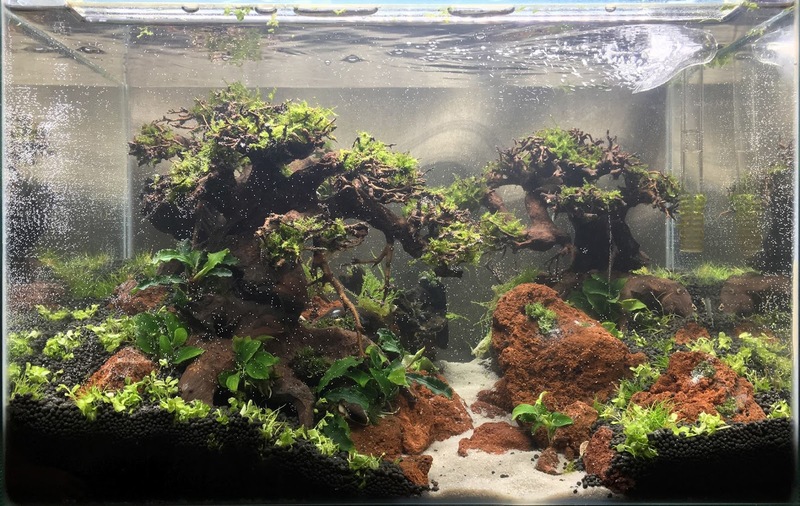 For those who don't know Filipe Oliveira is a world renowned aquascaper from Portugal, i had the pleasure of meeting him personally just a few months ago at a workshop. 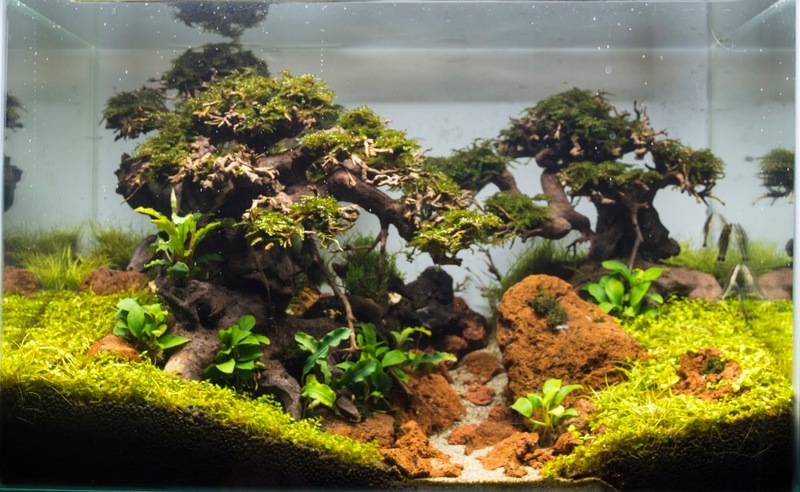 Filipe shot in to aquascaping fame in the late noughties circa 2006, 2008 when he entered IAPLC and AGA with a until then, never seen tree layout. As he himself told me, up until then we had nature aquarium and the older styles, where people were trying to recreate nature in an aquarium, but not trying to recreate a landscape or a scenery inside the aquarium. 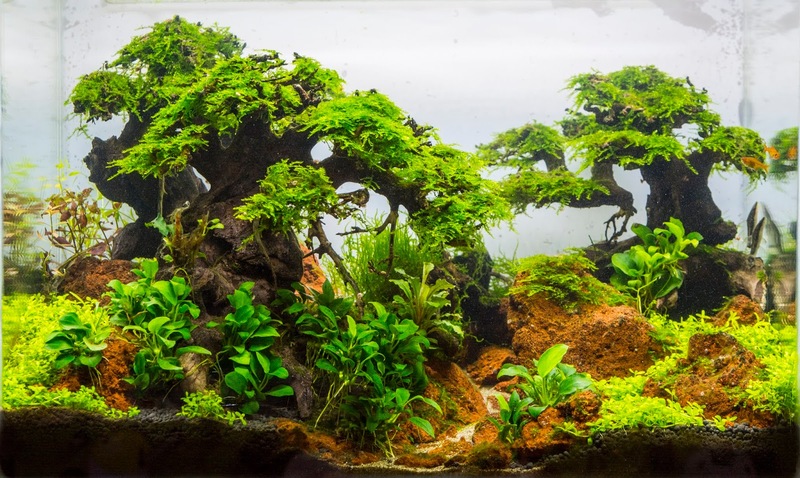 Then his first tree aquarium came out and turned the hobby upside down, since then, and its been a bit controversial to nature aquarium purists, we have seen the rise of dioramas and harscape intensive layouts that try to recreate landscape environments in the aquarium. This is even more obvious when you look at the top IAPLC entries in the last few years. When i first saw Filipe's tree aquarium, in the forum aquariofilia.net, i was just a beginner in portugal, and Filipe was not even famous yet. I was blown away and wanted to do something like that straight away. However i could barely keep plants and felt copying Filipe was out of my reach. Over the years he would release improvements on his original layouts, and though i feel the originals are still the best for their simplicity, purity and for breaking new ground, everytime he created a new treescape i would tell myself i wanted to do one. 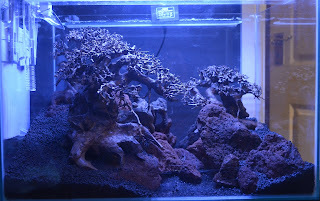 Last year however i decided to finally go trough with creating my first tree aquascape aquarium. A few years ago when i bought a new TMC signature aquarium i gave away my clearseal 45 cm tank to my cousin as it was surplus to requirement, lets say that the only way the missus agreed on a new tank was if the old one went out the door. So i gave it to him, who in a different lifetime kept fish, but is not really into aquascaping and planted aquariums. This was in 2015, however in the last summer he moved away to another town for working reasons and decided that he wasn't going to take it. I was more than happy to take it back and started plans straight away for a new layout. Like i said above the Tank is a clear seal, however i only had the glass, and barely no equipment for it, so i went on the hunt for a light unit and filter. The light unit i chose was the chihiros Aquasky 451, outside of the UK its only known as the Chihiros series E 451. This is a cheap ADA knock off that is a good bang for buck, its quite powerful, its not RGB, but it does give some very good greens and reds. The unit comes with a dimmer that allows for 7 levels of costumization in terms of power and the option for remote controller or manual. My problem was that the unit is built for 45 cm aquariums, which i believed mine was, a good reputable aquarium company like TMC, ADA, evolution aqua would surely make sure the tank is the size that was advertised. This clearseal however turned out to be 45,5 cm instead of the advertised 45cm. So the unit didn't fit. Don't take me wrong i am not attacking clearseal or their aquariums, recently i have seen good quality tanks from them, however when i first bougth this tank at aquarium design centre in central London they were more known for their cheap budget friendly brand, than for top of the line quality. For a 25 pound aquarium, this tank just keeps getting better but i still had a light unit that didn't fit my aquarium. The filter for this tank is a Dennerle scapers flow , i found this filter on some youtube videos. It's a hang on back cannister filter. This might be confusing but its the best way to describe it. Its a cannister filter, but its designed to be placed like a hang on back, hanging on the side of the the aquarium. This filter is a good choice for those looking for a filtration for a smaller aquarium, i would say up to 50 litres, even though dennerle rates it for more. It has a decent size for media, compared to the cheaper hang on backs, however its not as expensive as a true cannister. it looks stylish on the side of the tank, but when it comes to flow don't expect something amazing,though for smaller sized aquarium is adequate. It also provided a solution for my light unit size problem, as was able to use the hanging kit of the filter to also fit my light unit on top of the tank. The heater of this tank is a Fluval mirrored M, its a 200 watts heater and very large for such a tank, but after the filter and the lighing i didnt want to invest more on this project, so this one had to do as it was gathering dust around the house. The co2 system was the same i have been using in previous projects, a co2 art regulator with solenoid atttached to a fire extinguisher. The diffuser is a JBL glass diffuser i picked up a Aqua depot in London and its been a good diffuser so far. Now with the equipment out of the way its time to start talking about the layout. 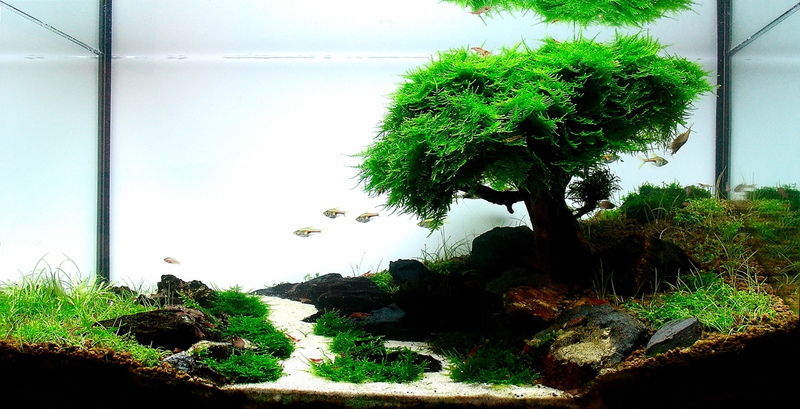 Like i said above the layout is a tree aquascape, inspired by Filipe's earlier aquascapes. And if its true that copying is the ultimate form of flattery, i didn't want to copy his works. I wanted to create something different, something i could call my own. While Filipe's design was more of a beautiful landscape, i wanted mine to resemble more a chaotic forest left to its own design, though this may not have been achieved well in the beginning, it was achieved over time as changes were made to the layout. Below are some pictures of the layout development. To create the layout i used lava rocks, and bonsai trees. I used my camera connected straight to the TV to get a better sense of how this layout looked on a photo. Sometimes layouts that look good on real life, don't translate well into a photo, as the machine only captures the image in a 2D environment. This becomes more of an issue when you want to send your final picture for a competition. Using this technique you can be sure that it will look good on the photo, and normally when that happens it also looks good in real life. I didn't plant this tank for a competition, but using this was a way of developing myself when building my layouts. I started the layout with a larger tree on the frontal left side, this was inspired by Filipe's layouts, i then started arranging the rocks to blend the tree and make it look like it had been there for a long time, after that i used some small pieces of redmoor wood that extended from the tree into right back area, as i was positioning the rocks i made sure to leave a narrow pathway all the way into the back on the center. When i looked at the photos i had this crazy idea, "What if i put another tree on the right side at the back, instead of doing a open area to contrast with the tree area, just go for a deep forest look. I looked for a smaller tree as i wanted to get a good feeling of depth by using a larger tree on one side, and a smaller on the other one. I was very happy with the look, and thought i was on to something, however there was something annoying me, there was a large empty space on the left back area, this was not visible on the photo, but i knew it was there and i kept thinking what am i gonna do about it, i thought about leaving it as negative space, but being hidden it didnt made sense to me as it had no visual impact at all on the overall look of the scape and i was looking for a dense forest look, and i felt the empty area at the back could break the ilusion. So after sometime going around this, the solution presented in the form of another tree, i decided to try and add a third tree in the back of that area, this tree, would be barely visible, but its presence would add into the overall feel of the design. The substrate for this project was JBL proscape brown and the sand was white sand. After this it was time to choose the plants, originally i went with micranthemum monte carlo, eleocharis SP mini, Xmas moss, flame moss, anubias petite, bucephalandra wavy green and riccardia chamedryfolia. The monte carlo was used in this design because i felt that being a tree scape there was a real chance that hemianthus cuba would struggle under the shadow of the trees once these were fully grown. The small sized aquarium was in my opinion more suitable to the small leafed cuba, but the choice was made for monte carlo. The flame moss was used at the back, i saw one of Dennis wong's Diorama forest scapes and he used this moss at the back with a great effect to create depth, the plant pops up far into the background from behind the rocks and wood and i figured it would look great if i could achieve the same effect in my design. The anubias and bucephalandras were meant to be used at the front underneath the trees, this would add variety to the foliage, making the forest look more complex, while allowing me to put an easy to keep plant in hard to reach areas and where less light was available. 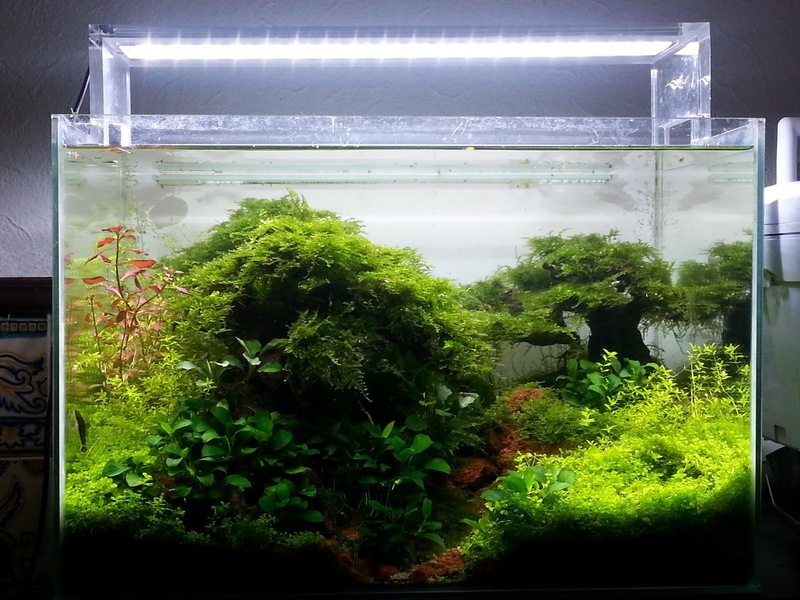 I also believed that the contrast between the larger anubias at the front, to the moss and hairgrass at the back would create an ever bigger sense that the scenery streched way back in the horizon. The scape was planted in October, from the get go i had the knowledge that i was gonna move back to Portugal in December, and that this tank would have to survive the long drive home. For that purpuse during construction i placed the rocks as best i could to avoid the substrate collapsing and i glued the trees and rocks to one another with epoxy putty. The planting design was simple, Xmas moss for the trees, flame moss at the back in between the trees, anubias and bucephalandra in the front at the roots of the trees, riccardia in the rocks and monte carlo and Eleocharis as a foreground. While planting it became obvious that due to the design and size of tank, access to this tank for planting and maintenance was very limited, so it would be a hard one to maintain over time. The first is a no- brainer, you go down Filipe's route, you use your good DIY skills, and create a tree by attaching smaller pieces of wood. Allows you a lot more creativity, but not everyone is comfortable with the drill and cutter. Though lately people have taken to glue the wood with superglue. The second is if you can get your hands on a dead bonsai tree, just to clear this up, some people have used dead bonsai on aquariums. But no one is in the business of killing them for aquariums. They are worth a lot more money being sold as alive. 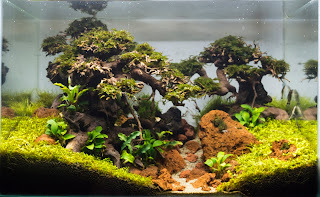 That said the wood from a dead bonsai is just like any other piece of wood, you dry it, treat and then you can use it in the tank to create a very natural looking tree. But since no one is in the business of killing bonsais, its though to find dead ones. Last but not the least, my option and the option in between, not very good at DIY so I purchased a handmade bonsai tree. This is a tree that is handmade from smaller pieces of wood and glued together to look like a tree. Its not as good looking as a true dead bonsai tree, nor is it so original as creating your own, but it is a good option. Some people don't like it and qualify it as fast food aquascaping though, were you buy your hardscape ready made. Planting these trees these days is a mastered skill, back in 06 when Filipe planted his first tree it was really though, the moss was always trying to come loose of the tree, and it was hard to shape it as the wood didn't have the frame of the top of the tree included like todays trees. In my trees, because they are full of small branches that create cracks and crevices, I just filled these with moss, which in turn grew around the branched frame to create a believable tree. I actually have little to do apart from trimming it down and keeping it clean. Not even the need to shape the moss to look like a tree. You can always glue the moss to it if you don't feel comfortable, use ciano acrylate only superglue, but I really don't see the need. If you are using a handmade tree, or one that does not have all the branches on the top, then you may have to create some small pieces where to glue the moss. You can use small pieces of slate, or just cut some sponge that you can attach to the top of the tree. This allows you to glue the moss on top of these platforms, once it grows they are not visible but will shape and keep the moss in place and giving it a tree top look. Another issue that rose a few days after planting was how artificial the pathway really looked. for the start the sand I was using was too white, it looked horrible, the issue was that the sand had a nice colour when dry, but it turned completely white once submerged. So one lesson I learned from this was always wet your sand and rocks before placing them inside the tank, you may not like how it looks. The second issue was that the pathway was too straight, from front to back, I tried to add details, but failed miserably as it looked too simple and fake. The solution to these problems was, I replaced the white sand, this is simple to do. Just use a hose and syphon out some water and while doing that use it to drain the sand out, after that just add he new sand. To avoid a mess, fill a small container with some sand, then submerge it slowly to the bottom, once at there flip it slowly to drop the sand. There will some cloudiness but it will disappear in a few hours. For the lack of detail of the pathway though, the solution was to break some lava rocks and add some smaller pieces to the pathway to make it look more complex and detailed. I tried to create some turns and banked it up at the back, this made it look like it was disappearing into the depth of the forest.It was still looking a bit centered, but that was all I was willing to risk doing for now. 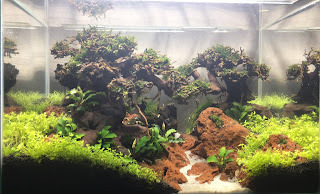 So with the scape planted and growing quite well, the carpet plants specially were doing it fast enough that I had to trim them down regularly. Trimming carpet plants is a very easy and straightforward task, you just cut them like you mow the lawn. Regular trims promotes new growth, helps the carpet grow compact and avoids the lower part of the carpet dying out due to lack of light. Around two months after and shortly before my travel to Portugal I started having a lot of brown algae problems on the Xmas moss, the tops of the trees were brown instead of green. 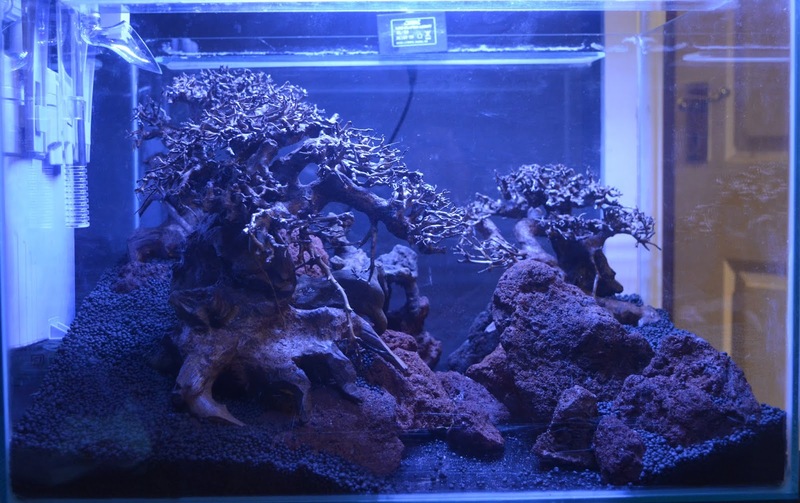 But as brown algae is common in new setups I assumed it would go away, plus I was already too busy planning on how this aquarium and scape would survive the 25 hour trip from London to south Portugal. 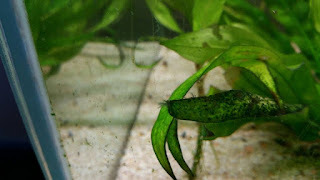 While living in London I did move house quite a few times, and having had aquariums for most of my time in there I got quite experienced at transporting aquascapes from one location to the next. I was gonna use the lessons from those moves and apply them to this trip, however there is a big difference between a 2 to 3 hour drive through London traffic, to a 25 hour dash trough Europe. This worked because my tank was small, I can't promise this same trick works on a bigger aquarium. I bought one of those plastic boxes from IKEA, the size was enough to accommodate the tank and equipment. I covered to bottom with a blanket, put the tank inside it, then I used the equipment to fill the spaces in between the tank and the box, in the end it was all solid and the tank wouldn't budge. I then filed the empty space of the tank with some plastic bubble wrap to help avoid the hardscape being displaced, remember I said previously that I had glued the hardscape together, so its was just for some extra protection. Finally I sealed the tank with cling film, like the one you use in the kitchen to make sure the inside of the tank would retain humidity and allow the plants to survive. After that I placed the box in the back of my grand scenic, I had a lot of luggage to take home which meant it prevented the aquarium box from sliding around the back of the van hence preventing damage. But if you don't have the back of the car full, then you have to find a way from keeping the box in place. The trip took 25 hours, we did travel at high speed, many times above the limit, but because it was all motorway driving it was smooth enough that the tank survived the trip without any damage. The tank drove 2213, 6 km (roughly 1375,5 miles), leaving London on 4 a.m Saturday December 16th and going trough the channel tunnel, crossing north France,trough spain and finally reaching Setubal in the south of Portugal on sunday the 17th around 6 a.m. And during all this time apart for a little mix between the substrate and sand, it was perfectly fine. Getting the tank to Portugal was actually the easy part, the problems started after it got there. I didn't factor in that the plants would be affected by the difference in water chemistry between the two countries, however this had quite an impact. Suddenly all the plants were not looking so good, the carpet specially was hit hard, it just started to melt and it looked horrible. The tank was scheduled to be on show in the first weekend of february at the Lisbon Petfestival and for most of january i didn't have a tank that looked anywhere near as good to take there. Most of that time was spent trying to recover the tank, but i just couldn't and a few days before the event i cut my losses removed all the damaged plants and replaced them. During this work a minor rescape was also carried out, the height of the substrate at the front was decreased, the pathway was curved slightly to the left and more anubias were added in the shadow of the trees. On top of that the entire carpet was removed and replanted. An thus i was able to take the tank to the petfestival for four days, it was shown at the aquariofilia.net booth and it garnered some attention, however it wasn't looking grown in. 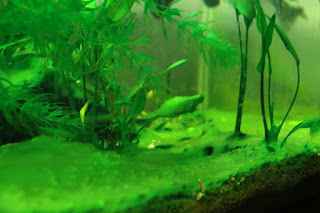 For the next few weeks the tank still struggled with some algae, specially on the trees. A lesson i take from this experience is if you are using moss on trees and its hit hard with algae, its easy to just remove all the moss and just wait for a the tree top to regrow. Even if you remove it all, there will always be some small pieces stuck in the crevices and a new and healthy tree top will soon take shape. Moss is a magnet for debris, so this is something i do every few months now even if there's no algae. Easycarbo was used to good effect on the algae and with time it just faded away. 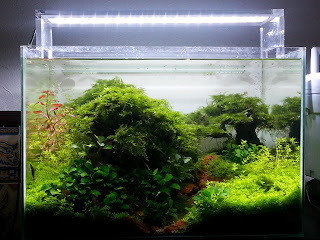 At the moment the tank is looking vibrant, healthy and it does give that deep forest look i was looking for, the plants are blending in together nicely making for a very natural scenery. There's a few ottocinclus in there and some cherry shrimps, i hope to get some ember tetras in soon, they are small and the contrasting colour will make a nice addition into the aquarium. This tank is still running. Right now its recovering from a heavy carpet trim, and i have been focusing on giving shape to the plants at the back. Its not looking as wild, but its looking more grown in as the plants start blending in with each other. At the moment the maintenance of this tank is weekly water changes, topping of evaporated water and daily fertilization. Proof that when you give time for a scape to mature, things become a lot easy and simple.